Memorial day will mark the fortieth anniversary of Little Willie John's death. One of the true progenitors of Soul, I don't think he gets nearly enough recognition. Born in Arkansas, he was raised in Detroit, where he and his brothers and sisters grew up singing spirituals accompanied by their mother Lillie on the guitar. The family formed a group called the United Five that began performing locally, and was soon laying them out at the Gospel programs. That wasn't enough for William Edward, though... they'd catch him climbing out his window to go sing under the street lamps. Realizing there was just no stopping him, Willie's father began entering his son in talent competitions, and by the time he turned 11, he had secured him a regular gig at the Book Cadillac Hotel downtown. He began getting noticed, and was actually hired on as a featured vocalist by Count Basie in 1951. That's the way you do it when you do the Hucklebuck..."
With the 5'4", 13 year old Willie singing those words over the band's original version, the crowds went wild. 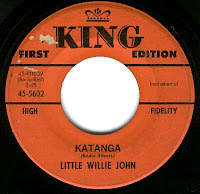 Syd Nathan, the head of King Records in Cincinatti, had passed on signing the young Willie when he was recommended to him by Johnny Otis back in 1951 (he had signed Hank Ballard instead). After an audition at King's offices in New York in early 1955, Nathan was quick to offer the young sensation a contract. It soon paid off, as he took a song Titus Turner wrote and produced on him all the way to #5 R&B that summer. The rockin' All Around The World spent four months on the charts, and Willie was out on the road as a headliner for the label before his eighteenth birthday. 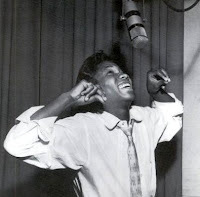 In September of 1955, John cut what I consider to be the first true 'soul' record at Beltone Studios in New York City. Written by his brother Mertis, Need Your Love So Bad featured the great Mickey Baker on guitar, and still slays me every time I hear it. When it was released in January of 1956, it would hit the top five as well, and Willie was in demand as one of the top R&B acts in the country. Nathan sent him out on the road that spring with another act he had just signed to his Federal subsidiary opening up for him, The Famous Flames, whose single of Please, Please, Please was following John's up the charts. After one more top ten entry, Willie busted things wide open with the release of Fever in May of 1956. Written by 'Bumps' Blackwell and Eddie Cooley, it's one of those elemental songs that will live on forever. It went straight to number one, and spent over six months on the charts. Significantly, it also crossed over into the Pop top 40, and paved the way for Peggy Lee's top ten cover a few years later. With R&B giving way to Rock & Roll, and more and more white teenagers tuned into black music, the teenaged Willie was more popular than ever. 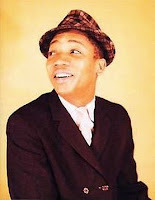 He was constantly on tour in those days and, as his sister Mabel said back then; "If you get into it so young, you don't have a complete childhood. That's what happened to Willie... he's a little boy doing all the things that little kids do." "Willie and I were the same age... he was a Scorpio, moody and deep, a Dr. Jekyll and Mr. Hyde, just like his crazy daddy, who sometimes came on the road as a chaperone... Another instance of someone getting in the business too early, Willie never did grow up. He sang with the pain and real-life experience of an adult... without ever becoming an adult himself. He played from the moment he woke up until the time he fell asleep. He'd spill lemonade over your head, pick your dress up over your head, stick his finger in your booty. Willie would do anything for a laugh. This was the time of his biggest hit, 'Fever', and man, he was feeling his oats. He was wild with his drugs..."
As far as the image Syd Nathan was selling to the public, however, he was just a romantic clean-cut kid, and they seemed to eat it up. 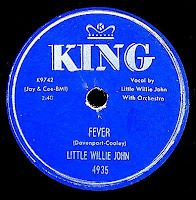 The B Side of Fever also went top ten on its own, and the follow-up, a remake of Billy Ward and The Dominoes first hit, Do Something For Me, made it to #15 in the fall of 1956. 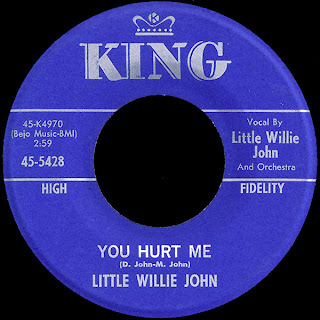 Amazingly, a song that is now considered one of his absolute best, Suffering With The Blues, was released as the B side of his next King 45, I've Been Around, neither side of which dented the charts... nor did the single after that, or any of the five King issued on him in 1957. Something was definitely up. Somewhere around in here, Willie apparently fell in love, and married a dancer he had met at The Apollo Theatre. They soon had a couple of kids, and he began bringing the family on tour with him. 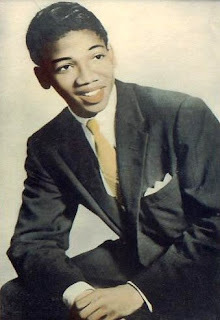 In the Spring of 1958, he hired Little Richard's ultra-tight Upsetters away from Dee Clark, and was carrying his own band with him as well. 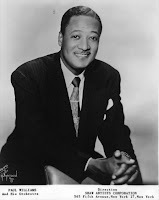 Now managed by Detroit's Harry Balk, he would hit the top twenty on the Pop charts that spring with Talk To Me, Talk To Me and was back in the limelight, which is just where Syd Nathan wanted him to be. At the place where soul meets the blues, Little Willie John tells the truth. I mean, just listen to this great record we have here today... can't you just feel it? Co-written once again by his brother Mertis, it was the flip of the Cooke-esque Walk Slow, another syrupy, string-laden piece of fluff that broke into the Pop top 50 in early 1961. It's hard to believe that something this good could be hiding on the other side of that record. According to the liner notes of the Charly compilation Grits and Soul, it was cut in Cincinatti in October of 1960. The session details go on to say that the guitarist is 'possibly' Cal Green, who had been The Midnighters 'axeman' since 1954, but I don't know about that. In the 'All' Music Guide article about Cal, it says "A 1959 marijuana bust sent Green to a Texas slammer for 21 months, but he briefly rejoined the Midnighters in 1962." So, I guess it wasn't him... anybody out there have any ideas? I think it's just killer, man. Willie would chart five more times in 1961 with truly MOR standards like Flamingo and The Very Thought Of You, but by the following year, he couldn't buy a hit. The song selection seemed to get even worse, with numbers like Bo-Da-Ley Dino-Ley and Katanga failing to connect with the public. As his star seemed to fade, his behavior became more and more erratic, and he took to carrying both a knife and a pistol to protect himself from his imaginary demons. His drinking and drug use increased, and you just never knew what was going to happen. 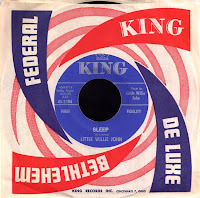 In late 1963, King chose not to renew his contract, but kept releasing records they had 'in the can'. 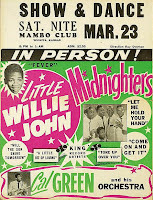 In August of 1964, Little Willie was arrested for attacking a man in a Miami club with a broken bottle. On the lam after apparently jumping bail, he left to play a few gigs in the Pacific Northwest. 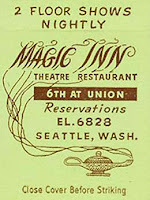 On Saturday, October 17th, John was 'already way drunk' on stage for his gig at a Seattle show bar called the Magic Inn, then left to continue the party at Birdland. By Sunday morning he found himself at an 'illicit after hours den', and in the middle of a fight. When a 6'2" ex-con named Kenneth Roundtree punched him in the face, Willie stabbed him. Roundtree died on the spot. 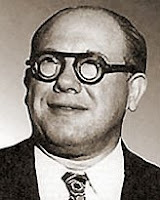 At his trial in January of 1965, his lawyers succeeded in getting the resulting murder charge dropped to voluntary manslaughter, but he was still sentenced to ten years at the Walla Walla State Penitentiary. 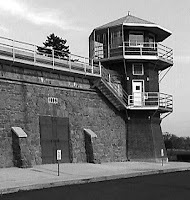 After exhausting all his appeals, he entered the big house in February of 1966. One can only imagine the horrors he underwent inside. 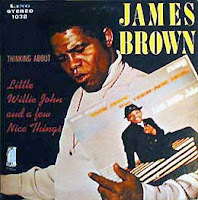 In those Charly liner notes, Bill Millar wrote; "In 1967 James Brown and his manager Ben Bart visited Willie in prison. They found a seriously ill man confined to a wheelchair 'I don't think I'm going to get out of here,' he told them." After contracting pneumonia, John was left to rot in a 'maximum security isolation room' where he died of a supposed heart attack on May 26, 1968. He was thirty years old. "I don't understand why people miss Sam Cooke so, and not Little Willie John... I don't deny Sam was great, no, ma'am. I guess Willie John never made it to the Copa. People forget where you been, and get it stuck in their minds where you ain't been." 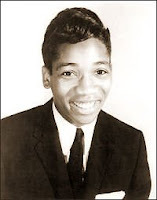 "...there will finally be a biography of Little Willie John, a no-holds-barred account of his triumphs and tragedies written by author and journalist Susan Whitall ('Women of Motown') with the help of Kevin John, Willie’s oldest son. The book will include never-before seen photos of Willie and his family; and for the first time, the details of his life with wife Darlynn, the beautiful Apollo Theater dancer he married in 1957, and his two sons Kevin and Keith, both of whom inherited his vocal talents (Keith sings backup for Stevie Wonder, to this day)." Can't wait! Thank you, Kevin! Great tribute to an artist who is seriously underrated. I'd like to talk to you about some of the information that you posted about Little Willie John. Lets just say that I am a relative. Please provide an email address or post a message on the Little Willie John Myspace page. beautiful song and great discovery for me. thanks a lot ! Thanks RED for your recent post regarding the Little Willie John myspace page and the copyright notice that you mentioned. Anyone that is interested in the upcoming book about Little Willie John should definitely visit the Little Willie John My space page. Little Willie John Capitol Sessions CD Released! WPON Radio's David Washington will feature the new Little Willie John CD release: Nineteen Sixty Six. These recordings have never been commercially released in their entirety. Listen to this program from anywhere in the world via the internet web site! To listen to the show go to WPON.COM and click on the Listen Live button and open in your favorite media player. I really love this song and this artist. I'd like to download it (legally) but I can't find a website which knows this song ! Which song/ Didn't see it in the post. i think its about time that they should talk more on Litlle Willie John he was an influnce on other artists in Detroit and on Motown artists to like Stevie,Diana,Marvin,Smokey Aretha were on the bill with Willie john and Stevie helped produced Willie John's 2 son Kevin and Keith albums and Keith John is a back up singer for Stevie Wonder and sister Mabel John once recorded for Motown,Stax and Ray Charles Raelettes. they talks about Otis Redding and Sam Cooke whose careers were cut short tragically a lot but not on Little Willie John,as well as Jesse Blevin speaking of Jesse Belvin,Sam cooke and Willie John and James Brown to were the best of friends.Jerry Butler aka The ice man said that Little Willie John,Sam Cooke ,Otis Redding and Jesse Belvin along with Johnny Ace ,Chuck Willis and Guitar Slim have so much talent a gift that was taken away much too soon and frankie Lymon and Roy Hamilton too. The long awaited and much anticipated Little Willie John biography is now out! Great news, Kevin! I can't wait to read it!